John was reading, while sitting in his wheelchair. I walked up and asked a favor. As I was speaking, he slowly closed his book and placed it between his leg and the side of the chair. I think that it was a bible, but I couldn’t be sure. He was happy to be photographed. And then, I realized that he had a friend in his lap. The name is LD, for Little Dog. 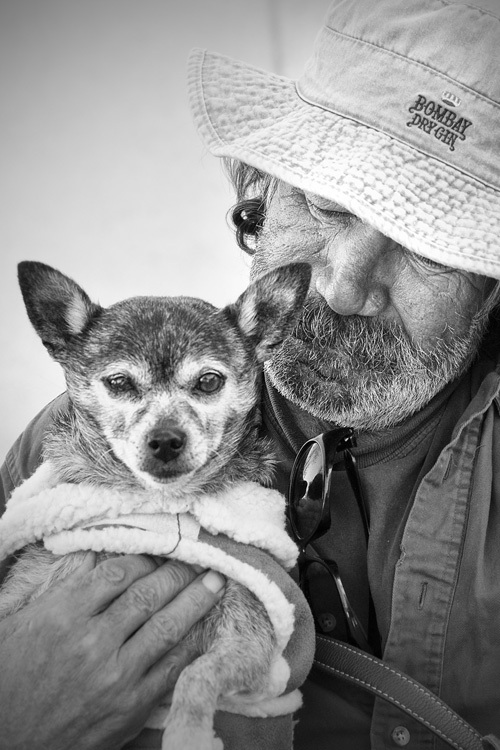 John found him in Key West, abandoned lonely. So John brought him home and tried to find someone to adopt LD. He hasn’t had any luck for 13 years, and I doubt that he’s trying to hard now. John says that LD is mentally tripolar. One of the poles tried to nip my finger, but he wasn’t too quick and I remained unscathed. John’s wife Kim approached and said that she got some crutch tips, so I guess that John can get around somewhat. I did not question his medical problem; it was difficult enough to approach him in the first place. Then John told Kim that I was taking portraits. Like magic, she evaporated.